Buy a Draft Guide/Podcast Ad!! "Required reading for CFL fans." - Al Cameron (Calgary Herald) "AWESOME! I suggest you guys pick up a copy!" 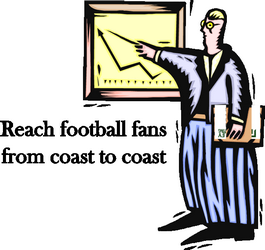 -Emory Hunt (Football Gameplan) Put your company into the hands of CFL fans from coast to coast. Thanks to the new CFL rules concerning the Canadian College Entry Draft this year's edition will be heavily weighted in favor of the CIS. No longer will NCAA underclassmen be available for selection along with CIS redshirts changing draft classes to 3 years after they completed their first season on the main roster. Check below for a nearly daily update of information and we will update the top 3 at each position on a more regular basis the closer we get to the Canadian College Entry Draft! Ottawa also draws in as a full member and will be looking to stock up on non-import talent! Players in gold have not yet applied for non-import status. Thank you to all that purchased the 2014 Draft Guide. The next few weeks will see a shift in our focus into a true media source. 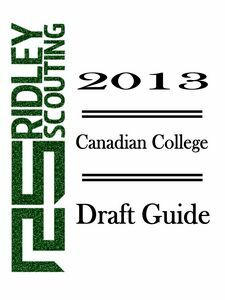 For the first time ever we'll publish a season preview guide that will expand on what the Canadian College Draft Guide has done for the past five years. Check out our new blog site that will be home to our articles moving forward. The goal is to produce five articles a week. If you'd like to advertise on our site please see contact us! Check out our Podcast home too. There are advertising options there too! Reach a nation wide audience that is growing each week. Evan Gill (DT, Manitoba) has reportedly torn his quad. This will move the former first round lock (potentially as high as #3 overall) down for sure. Recovery time places him back at training levels approximately the 3rd week of the CFL season. Update: Evan Gill has released a video showing ladder drills this afternoon. The debate continues? Players go thank your mother's for all the drives to practice, jerseys that they washed and cleats that they cleaned up over the years. No players from the Quebec conference of the CIS have been selected in the first round since 2010. This year that will change. Former UBC Thunderbird and Hec Crighton award winning QB Billy Greene will be playing this year in Sweden. His profile with the Royal Crowns can be found here. Working to determine the eligibility of a young man playing NAIA football. Potentially an entry for the supplemental draft. Celebrating our 11th Wedding Anniversary. Back to the Draft talk on Monday. New podcast is up and ready to listen to. Top Prospects Canada is running school testing sessions in BC this month. Looking forward to seeing the results from schools in Surrey, Prince George and Kelowna. Contact Top Prospects if you'd like to have a scout come in and run a session at your school! 59.2% of the players drafted in the past 5 years are still active in football. 54% on CFL rosters. Podcast is up from TSN1260 - fast forward to the 21st minute. In the last 5 years the Riders have used 40.9% of their draft picks on OL. The highest of any team on a single position group. We'll be on TSN1260 (Edmonton) tomorrow at 10:25am Mountain Time. Discussing the Draft Guide and Ridley Scouting in general. Looking forward to it! Also will be on the BCLionsDen Pawdcast this week as well. The last center drafted first overall in the CFL Draft was Chad Folk in 1997 by the Toronto Argonauts out of Utah. Some formatting errors have slowed our progress but the 2014 Draft Guide will be available this week. More player grades than ever before!! Showing the case for Non-Import running backs and receivers. University of Calgary has had 15 players drafted in the past 3 years leading the way. Over that time 151 players have been selected from 64 different schools. Justin Dunk is reporting that David Foucault (OL, Montreal) talked to 6 NFL teams at the NFL Super Regional held in Detroit. He was one of only 3 OLs to meet with teams there. Defensive linemen made up 14% of the total number of non-imports on the 46 man rosters (174) but only 7% of the non-import starters. The value of each position group goes up or down based on the depth in that grouping. Expect kickers to go earlier than your first impression. Ottawa RedBlacks have their mini-camp underway in Richmond, Virginia. Winnipeg Blue Bomber fan blog (2nd and 10) has some thoughts at who the Bombers will select with their first two picks. Clear indication that this young man is getting good advice. Draft stock is up following the CFL Combine. Adding interviews to the Draft Guide. Canada be proud of your CIS student athletes - quality athletes, quality students and great people! Latest podcast is now online. Thanks to Jacquie Sutherland for the initial question that got this one rolling. Here's all the other podcasts in case you have trouble sleeping or just want to catch up! A 2 day football camp in Saskatchewan with CIS, CJFL and NCAA coaches there to evaluate the talent. Save $50 by signing up early, save $75 by signing up in groups of 3 or more! Lowell Ullrich reports that Jabar Westerman has declined extending his contract. What does this mean for the CFL Draft? Do they try to find a replacement or do they avoid the position all together? CFLDaily's list of Draft Prospects and ranks them in position groups. The continuing saga of Adam Thibault (DB, Laval) continues as he will attend the NFL Super Regional combine in Detroit April 12th and 13th along with David Foucault (OT, Montreal). The athletic Thibault is a man without a home as teams review where on the field he could line up in the CFL. Having spent 3 years at Laval as a receiver before making the switch to safety in 2013, the transition wasn't a complete success although he has the quickness and intuition that teams may wish to continue that experiment. Updated the Defense portion of the Top 3 Depth Chart. Moving forward with a HS football camp this July in Saskatchewan. Details on registration coming soon! CFL.ca article on Anthony Coombs (RB, Manitoba); I see him more like Andre Durie myself and could transition to being a receiver if need be. Makes him a value to all 9 teams instead of being pigeon holed to be a back up non-import for one of the teams that features a non-import running back. New Podcast talking about running backs available in the Draft, how running backs were used in the CFL during the 2013 Season and Laurent Duvernay-Tardif's Pro Day. Back episodes of the podcast can be found here too. Laurent Duvernay-Tardif adds two more NFL team visits as Kansas City and Miami join the party. CFL Draft Stock drops even farther. This talk that no CIS player draws NFL attention is getting a little out of hand. Let's go back only 1 draft year and you have the #1 (Linden Gaydosh) and #10 (Stefan Charles) overall CFL Draft Picks stick in the NFL, both coming out of CIS schools. Also the #2 overall draft pick stuck in the NFL as well but came from an NCAA school. 2012 the #7 overall CFL Draft Pick (Kirby Fabien) ended up signing with the Giants out of a CIS school. 2011 was NCAA heavy and the CIS players made an impact early but still Queen's Matt O'Donnell ended up with both a NFL and NBA tryout. 2010 saw 5 CIS players sign with NFL teams. So sure you can say that the level of interest that LDT is more than most but perhaps it's also building on the shoulders of those that have come before. Let's give credit to the CIS for being a quality product that deserves a lot more respect on the Canadian sporting landscape than it has been getting in recent decades. Testing Numbers - 40 Yard Dash: 4.86 (electronic); Shuttle: 4.32; L-Drill: 7.32; Bench Press: 10; Vertical: 30.5"; Broad Jump: 8'6.5"
A two time CJFL All-Canadian, two time All-BCFC All Star and then followed that up in the CIS with 2 AUS All-Conference and a second team All Canadian. His testing numbers may not have placed him in the early rounds of the draft but you can't ignore his production. Two consecutive thousand yard seasons as a junior and work horse status in the AUS where he averaged a 100 yards per game in 16 career regular season games. Players named for the 2014 East West Bowl. It's a strange year with the East West Bowl occurring ahead of the CFL Draft. Busy weekend for scouts. Testing Numbers - 40 Yard Dash: 4.57 (electronic); Shuttle: 4.22; L-Drill: 7.03; Bench Press: 5; Vertical: 33.5"; Broad Jump: 9' 2"
His testing has really increased the interest level of media, fans and teams alike. Trouble is will CFL teams use a NI as a kick returner? We haven't seen that as a regular job for a Canadian in a while. Most definitely his draft stock has gone up since the Edmonton Regional. Max Caron and Quinn Smith are nearly polar opposites on paper. Reading the post-Combine wrap up articles and some players are getting a lot more notice than others. Including a couple that the variety of articles claimed some individuals had their draft stock both rise and fall. He mentions having food for 50 people. Hopefully not needing to feed 50 offensive linemen! The McGill linebacker saw his draft stock rise at the CFL Combine thanks to a strong performance in the testing sessions and the one on one drills. He has entered the conversation of being a potential first round pick now after looking like a 3rd/4th round pick only a few weeks ago. Testing Numbers - 40 Yard Dash: 4.57 (electronic); Shuttle: 4.50; L-Drill: 7.33; Bench Press: 27; Vertical: 38.5"; Broad Jump: 9' 4.5"
Testing Numbers - 40 Yard Dash: 4.62 (electronic); Shuttle: 4.19; L-Drill: DNF; Bench Press: 15; Vertical: 32.5"; Broad Jump: 10' 0"
Scott Mitchell weighs in with a mock draft! Dan Ralph weighs in with a strong article on David Foucault. The Toronto Regional Combine posted the top 4 40 yard dash times for draft eligible players. Someone has created a 16 team CFL and it's complete with uniforms. Give it a look! Have you visited Laurent Duvernay-Tardif's website yet? Have you seen Casey Chin's (LB, Simon Fraser) stat line from last year? Adam Thibault (DB, Laval) ran a 4.49 laser timed 40 yard dash at the East West Shrine Game last May. Can he repeat that effort at the CFL Combine? Max Caron (LB, Concordia) has a great CIS resume. However he ran a 5.03 40 yard dash at the East West Shrine Game. Will he get that dropped down at the CFL Combine? David Foucault (OL, Montreal) has been working towards the NFL Regional Combines. Not sure at this point which one he's scheduled to compete at. According to CanadaFootballChat CIS recruiting has reached the 550 recruit mark for the Class of 2014. That means we are about 70% of the way through the recruiting season. Will have a new Top 3 Draft Chart up for Monday. Some movement among the draft spots. Laurent Duvernay-Tardif (OL, McGill) has decided not to workout at the CFL Combine. Instead he'll run through drills at a pro day at McGill University. In the States it's QBs that avoid the Combine, in Canada it's the OL. No draft implications because it's the CFL but long time CFL QB Buck Pierce has retired. We've been asked in the past about having a podcast, so this week we'll launch our first podcast talking CFL, CFL Draft, Canadian CIS and HS football. I'm sure some NCAA talk will show up there too as spring practice has started at many schools and I'll visit as many spring games as I can. Another CFL Draft Pick involved in a trade. Bombers bring in QB Brian Brohm from Hamilton for a conditional draft pick. CJFL facing a transition year. OFC has voted to increase the age from 21 to 24, it may lead to a split in the CJFL. In response the BCFC has voted to allow for 5 overage players per team. Lots of interesting discussion will occur at the CJFL Annual General Meeting in April. Yesterday 2 Canadian football players in the Class of 2015 received NCAA Division 1 scholarship offers. Check with Top Prospects Canada for more details and to set up your own profile in football or basketball. CFL - Free agency opens tomorrow, while it's exciting it's not as crazy as free agency in other leagues. Last year Edmonton was fined for announcing a signing within minutes of the opening, guessing we won't see a repeat of that this year. CFL - Draft Pick Trade - Winnipeg Blue Bombers trade the 24th pick overall in the 2014 Draft to Calgary Stampeders for the 26th pick overall and the negotiation rights to DB Chris Randle. Following the deal they signed Randle. Edmonton held two tryout camps on the weekend in Texas. Houston on Saturday and Carrollton on Sunday. Yesterday was a travel day for me so catching up today. Senior Bowl - Very windy day in Mobile. The gusts made several FG attempts pause in mid-air before coming up short and then the next try would go 20 rows up into the north endzone stands. Senior Bowl - Talked briefly with Hamilton Tiger-Cat property Brent Urban who mentioned that he has talked to nearly every NFL team and is looking forward to the game. He is enjoying his time at Senior Bowl and glad for the chance to compete. Senior Bowl - In a personal note I got the chance to meet Ed Orgeron. Coach O is a coaching icon for me and one that I'm glad I got the chance to meet. Senior Bowl - Tajh Boyd (Clemson) was our favorite QB of the day. Many tweets about how Logan Thomas (VaTech) was their top QB but I didn't see him complete a pass longer than 4 yards while I was watching. Thomas is very athletic and shows the ability to roll out but wasn't connecting with receivers. Chris Borland (Wisconsin) had a big lick on Jeff Janis (Saginaw Valley State) that drew comments from the crowd. Kadeem Edwards (Tennessee State) looked good on the line. Ra'Shede Hageman (Minnesota) put himself through some self discipline for not getting separation from the OG and gave some extra burpees while waiting for the next drill. Virginia DT Brent Urban plays too high but he's got very strong hands. Looks like a 3-4 DE.
.@RidleyScouting My proposal is to include all Canadian-born players & change "5 of first 18 yrs" to "3 of first 19 yrs". Rule is outdated. 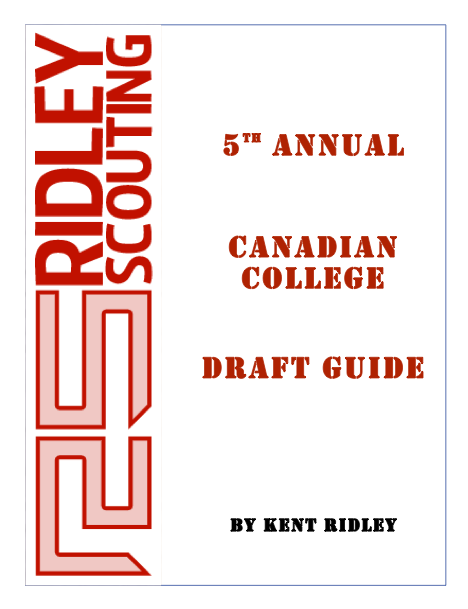 The 2014 Canadian College Draft Guide will be available on Lulu.com this year. Looking forward to it! May 6 - Draft Day!!!!!!!! Didn't know this would be final #CFLDraft that underclassmen could be picked. Starting next year, only seniors eligible." 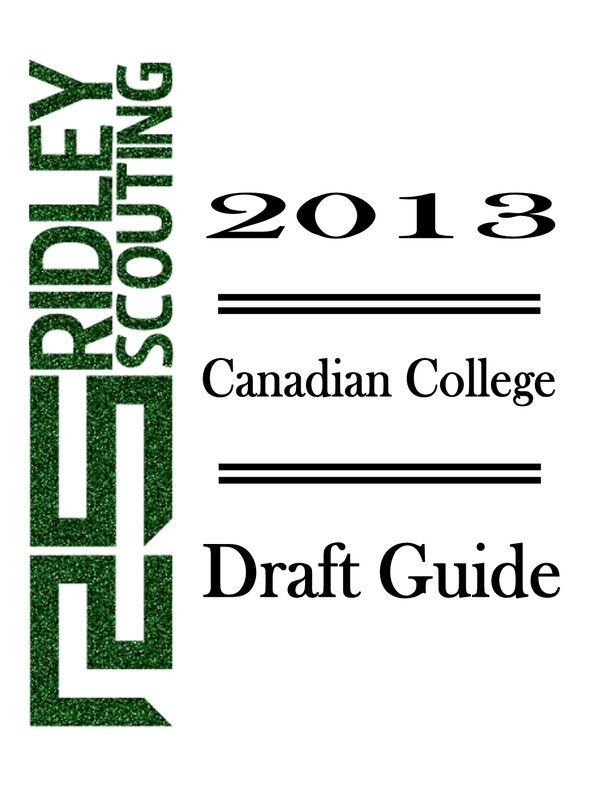 Ridley Scouting has released the Draft Guide Update today. Enjoy the extra features! Draft comments from Rider Prophet Special thanks to a 2013 CFL Draft Prospect's Mom for posting the link! Can't wait to see the CFLDaily.ca Draft Show. Should be a good one! April 25 - Today is the start of the NFL Draft. Looking forward to many hours of hearing "Now on the clock..."
From 1988 to 1991 Saskatchewan and Winnipeg played a pre-season game in Saskatoon. Would love to see that return! More Stefan Charles, this time from the Province. He played junior as a Ram, CIS as a Ram, wouldn't it be great if he got drafted by the Rams? Calgary Stampeder fan "Goal Digger"
April 20 - HS Senior Bowl tryouts are underway in Alberta and Saskatchewan which is always a fun study in human relations. April 19 - The Draft Guide is complete. The drama in Boston did delay us last night as we joined so many around North America in following the actions. If you have any loved ones in the Boston area, hopefully they are all safe and sound. April 15 - More and more reports about NFL teams being interested in Stefan Charles. We bumped Stefan down our chart a couple weeks ago expecting this and now it appears that the rest of the country is catching up. His draft spot in the NFL will completely affect his CFL spot. Ryland Smith (DB, Bishop's) had a big JR year including 12 Passes Defended! April 12 -Let's have some fun today. Here's a quick look at the Draft Class of 2015! April 11 - Quick sound byte from Linden Gaydosh on Matt Vonk. April 10 - Stefan Charles has met with Seattle and will have a second meeting with Indy this week too. April 8 - The pre-orders received their Draft Guide Part 1's today. Looking to finish up the player profiles this week to send out the entire Guide. It's 4 weeks to the Draft and we're getting excited! The RiderFans board is always an interesting foray into the mindset of a fanbase but here's a Draft related piece from "CC Ryder"
April 2 - Added 3 interviews to the Guide today. 2 linebackers and a running back join interviews with Instant Scouting, Rouge Radio and the new GIFL. This is building on the amazing interviews we had in 2012 with Marc Mueller, Austin Anderson and many more. April 1 - No April fooling here. Back to work. Love that spring camps are open on both sides of the border. Spring game in Memphis this weekend at the former home of the Mad Dogs, the Liberty Bowl. Here's a link to spring practices for Guelph here. March 31 - Happy Easter y'all! A computer glitch turned into a late night for us. Always nice when 3 hours of work disappears! 3am isn't a good time to troubleshoot things. We'll see how far behind this puts us but it's back to work today. Loving this DL group and potentially it will lead to a big number of them drafted. More DL than OL? We'll see. March 30 - Early morning update. The Draft Guide has added interviews from InstantScouting and Rouge Radio. Waiting on a few more that are out there and will round out the edition. March 29 - Have a fantastic Good Friday in whichever way you celebrate this holiday weekend. Tonight reviewing the Canadians playing in JuCo's around the USA. The real question isn't whether Kalonji Kashama can play at the next level but "are there any more Kashama's left in Brampton?" Kareem Ba (DE, UBC) had 12 tackles at the East West Bowl. He only had 27 hits during the 2012 season. So which is the truth? March 28 - 2011 Montreal draft pick Vaughn Martin (DT, Western) has signed a FA deal with the Miami Dolphins. March 27 - A sad day in the CFL as Ron Lancaster Jr. has passed away. Condolences to the Lancaster and Mueller families in a tough time. We are so grateful to that family for the access they have given to us in the past! March 26 - Mike Edem (LB, Calgary) ran a 4.57 at the Combine which was 2 tenths faster than the next LB (also a Calgary product - Tom Spoletini). The former RB has flown under the radar after transfering from McGill in 2010. In the last 2 years he has 0.5 fewer TFLs than Ben D'Aguilar (DE, McMaster) and more total hits. Future Look: 2015 Draft Class member Christian Covington (DT, Rice) had 43 Hits, 8 TFL, 5 sacks, 1 FF and 1 PBU. We like him as a Top 3 pick in the 2015 Draft. March 25 - So how would injured Andy Mulumba (DE, Eastern Michigan) have done against the 8 DLs that were at the CFL Combine? Using his pro day numbers from March 13th here we go. Bench - 4th; Vert - tied for 2nd; Long Jump - 3rd; Shuttle - 7th; L-Drill - 3rd; 40 yd dash - 2nd. Oh yeah he also made 11 tackles in one game against Central Michigan this year. March 24 - The big day on the field at Varsity Stadium. They made the OLs run the 40 first. Looks like they are speeding through the linemen as both groups have run their tests and are getting suited up for the contact portion. Corey Watman (OG, Eastern Mich) had more bench press reps at his Eastern Michigan pro day than at the CFL Combine (33 to 31). But he ran better and jumped better at the CFL Combine than his pro day in every other test except the vertical jump which was 1/2" lower. Nolan MacMillan (OT, Iowa) is listed on the Iowa depth chart 3 times. Starting LG and back up for LT and RT. March 23 - Big performance from Bishop's DL Elie Ngoyi (DL, Bishop's) with 40 reps on the bench press. Fellow DL Linden Gaydosh (DT, Calgary) put up 36 reps.
Stu Van Dusen who plays for the semi-pro Austin Vipers down in Texas was at the NIC. Hope he isn't flying back to play in their game today. Back to reviewing DBs while waiting on the next testing session. JP Shoiry has good things to say about Sherbrooke prospect Patrick Chenard. Film looks good and played as a defensive halfback (a spot no CFL team started a non-import). March 22 - CFL Draft Prospect CO Prime (LB, Wagner) faced fellow CFL Draft Prospect Eddie Houghton (RB, Holy Cross) last year with CO Prime making 4 tackles on Eddie. Track the CFL Combine events on TSN here. Duane Forde's annual NIC is also underway today. Morning session should be complete by now and they should be headed over for the afternoon session. CFL Free Agent Ismael Bamba ran a 4.37 40 at the NFL Regional Combine in North Carolina. Bamba was a 6th round draft pick (39th overall) in the 2012 CFL Draft. March 21 - Reviewed defensive players and have a logjam for the top DBs. Neil King (Saint Mary's) bumped up the list and will be a player we'll review again this weekend. 5 DBs will be in tough for their spots, good in different ways. Jesse Joseph (DE, UConn) is an interesting prospect and it will depend on his health status and likelihood of re-injury as to where he ultimately sits. and we'll answer as many as we can!